March 27, 2015 ~ Things are getting exciting at the Smith Oaks Rookery in High Island, Texas. My fave photographer Bill Maroldo and I made another trip March 17-18. There are more birds now than our trip first of the month, but still a lot of bare trees making for excellent visibility. The Great Egrets are busy building nests and the Roseate Spoonbills are just starting to pair up. Stick is the word of the day. 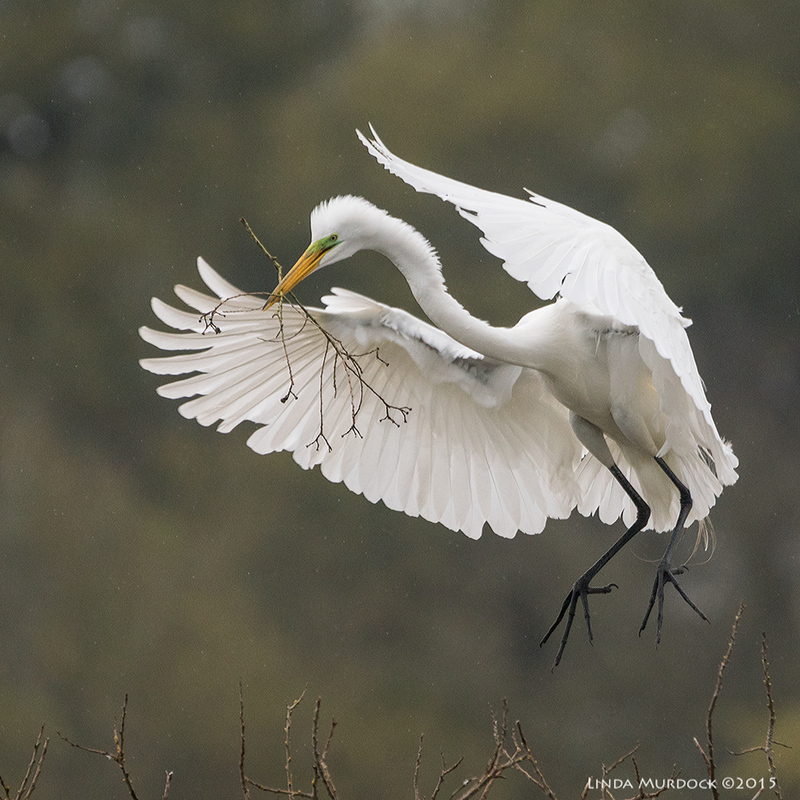 Male Great Egrets are bringing sticks to their mates for nest building and improvement. Whatever the offering, she seemed thrilled. The Great Egrets always greet each other with wild squawking and enthusiasm. I find this fascinating, because the rest of the year they are mostly solitary hunters and scare off any other egret that comes in their territory. Nest building is hard work! ...to work into the nest. Sometimes he helps her with the nest weaving, but often he just stands around until he flies off to find another stick. Or they engage in a bit more pair-bonding.. I have tons of photos of them mating, but a lot of them are obstructed by sticks. I am thinking the multiple matings allow the female to lay eggs over a period of days. She generally lays 3-4 eggs which will be incubated by both sexes for 23-26 days. The eggs don't all hatch at once; and the first born and/or most aggressive chick gets most of the regurgitated food. Weaker chicks may get pushed out of the nest by larger older siblings. We plan to return at least one more time to see some chicks. During the height of the Spring migration it gets extremely crowded around High Island. Birders come from all over the country; every other car has an out-of-state license tag and there are many high-dollar guided tours. And so we can end on a splash of color, here are some Roseate Spoonbills from that same trip. They weren't mating yet, but there was a lot of action - chasing and clacking bills, plus an odd rocking in unison behavior that must be part of their mating display. I recently learned the female spoonbill holds a stick to signal she is ready to mate. Then, a male perches next to her and they start that bobbing and rocking motion. And I want to welcome my new readers from Facebook. I resisted having a page for ever so long but now that I do, I have had a great time sharing my photos and seeing others' in Birds of Texas and several other groups. Thanks for stopping by and if you want to subscribe to get an email when I post new material, the form is up top of the right-hand sidebar. Don't you think these birds are magnificent? And imagine getting presents all day long! Let me know in the comments what you think.